Some links. I suppose I should make a hairy great Terminal link icon, but this one is of a beautiful Amur leopard which does match the first link and shows you what an adult looks like. And now for some from the How to be a Retronaut site which zoefruitcake told me about. Smiling Victorians - candid shots of happy Victorians. Colour film of 1920s London - fascinating stuff. It's amazing how much more real and immediate the past looks in colour. Coloured stereo views of Japan from about 1895 to 1910. They're meant to be used in a viewer, but they've animated the two views to give an idea of the 3D effect. USB Typewriters for a steampunk keyboard! And speaking of that, Steampunk stormtrooper! Classic photos redone in Lego. My favourites are the moon walk and Maradona's 'hand of God'. For more of the past in glorious colour, feast your eyes on these amazing photos of the Tsarist Russian empire which I posted about a few years ago; click on the links in the Exhibition Sections. 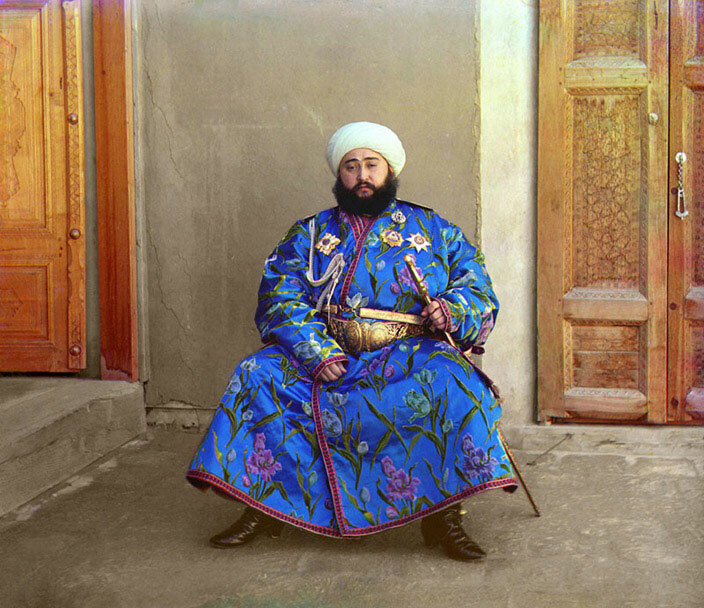 One of my favourites for its stunning colour is The Emir of Bukhara in the Ethnic Diversity section.